OneHumor | STD - OneHumor is a collective of cool content featuring funny videos, funny movies, classic TV ads, virals& silly pictures. 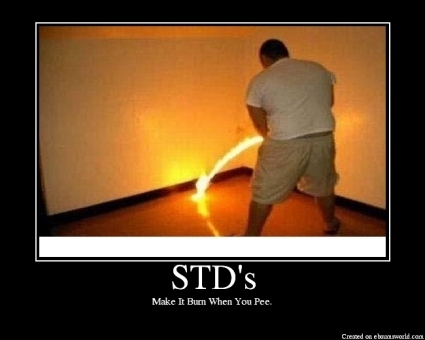 Well, let's make sure we don't get the STD this dude's got..OMFG!!! We laugh because it's funny, we laugh because it's true. You can only imagine the number of greasy-haired pedervs that have to confront each other's sweat-beaded face when trying to entrap young kids. Maybe like 5 or so. Sometimes feels like you're arguing with a dictator. Agree or no one is having any seXX0r! It's obvious that Jeebus is employed at this store, but I always thought he was a carpenter not a cobbler - WTF? Is it cold in here or is it just me? Do you ever get the feeling that the temperature just dropped and you need a visual reference to verify it? I can't stop staring... Her eyes are just that mesmerizing! Life's eternal question and if you get it wrong it could mean a whole world of pain! but never fear, follow this helpful guide and you will be set for a life of bliss! Ain't this just the truth. Spy on your neighbour with a pair of binoculars and you're a perv, do it online on Facebook and, hey, why not? No one's gonna know, right? Stuck for a stocking filler present for the little 'uns this Xmas Well, don't despair because it seems there's a big recommendation right here for some good wholesome family entertainment. They'll scream with joy!